Choosing the right motorbike oil: What does JASO and JASO MA2 mean? What does the JASO MA and JASO MA2 Motorcycle Oil Standard Mean? In 1998 the Japanese Automotive Standards Organization (or JASO for short) developed a grading system for motorcycle oils. The grading system measured (among other things) an oils ability to resist clutch friction (or slippage), protection offered against engine wear and pitting in the gear box. 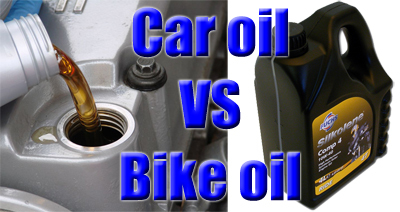 It’s WAR in the car oil industry…..
…..And how it can ruin your bike engine! The recession is hitting some industries hard now and some companies will do ANYTHING to sell their products….. But how does this affect using car oil in a motorcycle engine?